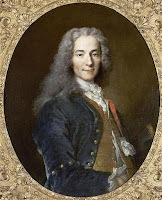 Rodama: a blog of 18th century & Revolutionary French trivia: Voltaire: Jansenist? Voltaire : was he influenced by Jansenism? In 1720 Louis Racine (youngest child of the dramatist) published his poem La Grâce, versifying Jansenist theology; Voltaire, who had hitherto been friendly and admiring of Racine, promptly responded - his verses, published on 30th January 1722 in the Jansenist journal Mémoires historiques et critiques, denounced Racine's support for fanatical dogmas which portrayed God as a tyrant. Later in 1722, in the Épître à Uranie, these sentiments become part of a thoroughgoing attack on Christianity: "They make of you a tyrant, but I seek in you my father / I am not a Christian, but it is in order to love you better"
Surely not. There are a couple of manuscript poems attributed to Voltaire which Auguste Gazier thought he might genuinely have written (p.617-8). The subject matter is to say the least unpromising: in the better known, the Jansénius, a ghostly Jansen appears to Cardinal Fleury to plead the appellant cause; only the Arsenal copy of the manuscript ascribes it to Voltaire. The second, Ode sur les matières du temps is a diatribe against Ignatius Loyola and the Jesuits. Since the first poem alludes to Bishop Soanen's imprisonment in the abbaye Chaise-Dieu it cannot date from before 1728, by which time Voltaire was already in England. There is absolutely no evidence that Armand wrote it either. Voltaire's sympathy with the Jansenist cause is made more plausible by his curious involvement with a Jansenist miracle. 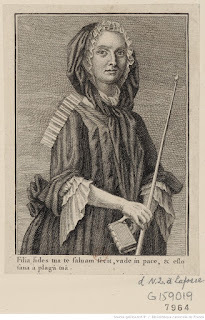 On 31st May 1725 Anne Charlier Lafosse, the wife of a cabinetmaker from Saint-Antoine, was cured of paralysis and haemorrhaging during a procession of the Holy Sacrament in the parish of Sainte-Marguerite, which had a Jansenist curé. Voltaire's curiosity was piqued and he admitted visiting the woman often (Letter to the présidente de Bernières dated 27th June). To his embarrassment he featured in Cardinal Noailles's pastoral letter of 10th August which defended the miracle. He is described as a man well-known in society ("un homme connu dans le monde"). who had been moved by the miracle and tried unsuccessfully to press a charitable donation on M.Lafosse (p.12). Voltaire was called on by Mme Lafosse in person and found himself invited to a Te Deum at Notre Dame in thanks for the miracle. In a further letter to Madame de Bernières, he dismissed the matter lightly: we learn that the abbé Couet, who had written the archiepiscopal mandement, had sent him a copy; Voltaire sent his tragedy Mariamne in return, declaring that the sum total of their joint efforts was bound to be a comedy....Many years later, in the Siècle de Louis XIV, he spitefully recounted the story, which was quite untrue, that Madame Lafosse had been struck blind three months afterwards. Every good Frenchman applauds a Jansenist when he speaks out against formularies and excommunications, and makes a little mockery of the infallibility of the Pope; but we despise a fool who has himself crucified, and still more the idiot who is assists at Jansenist "crucifixions in the attic". Miguel Benitez, "Voltaire libertin : l’Épître à Uranie".Revue Voltaire 8 (2008), p. 99-135. Extract from The Age of Louis XIV. trans. Pollack (Everyman Library) Chapter 37. ....The enfeebled Jansenist party resorted to miracles; but even their miracles did not succeed. An aged priest of Rheims, named Rousse, who had died as they say in the odour of sanctity, cured toothache and sprains, but in vain; the Holy Sacrament was carried to the suburb of Saint-Antoine in Paris and after three months cured a woman, named Lafosse, of a haemorrhage, though at the same time turning her blind; but the miracle was no more successful than the first. At length some fanatics conceived the notion that a deacon, named Paris, brother of a councillor in parliament and buried in the cemetery of Saint Médard, was about to perform miracles. Some votaries of the sect who went to pray upon his tomb were so carried away by their imagination that in their deranged state of mind they suffered slight convulsions. The tomb was immediately surrounded by people; crowds gathered there night and day. Some climbed on to the tomb, giving their bodies strange twitches which they regarded as miraculous signs. The secret instigators of the sect encouraged such frenzies. Prayers were recited in the vulgar tongue around the tomb; the air was full of accounts of deaf people who had hard a few words, of blind who had caught glimpses of something, of cripples who had walked upright for a few moments. The miracles were even attested before the courts by a whole host of witnesses who had almost seen them, since they had come there in the hope of doing so. The government allowed the epidemic to run its course for a whole month. But the crowds grew more numerous, miracles increased and it was necessary at last to close the cemetery and place a guard around it. Thereupon the same fanatics proceeded to work their miracles in their own houses. The tomb of the deacon, Paris, was in very truth the tomb of Jansenism in the minds of all sensible people. In less enlightened times such farcical proceedings would have had serious consequences. Apparently those who provoked them were unaware of the age in which they lived. Superstition was so rife that Carré, a councillor the parliament, surnamed Montgeron, had the audacity to present to the king in 1736 a list of all these miracles, attested by a large number of witnesses. This madman, the spokesman and dupe of maniacs, said in his memorandum to the king, "that one could not help believing witnesses who died in support of their evidence." Should one day his writings be in existence while all other books are lost, posterity will look upon our age as an age of barbarism.